A new survey of by PayPal confirms that people are spending less on each other this year than they did before the economy took a crash but that doesn't mean they have stopped giving gifts altogether. The majority of men who took part in the survey reported that they wished they could give more to their special someone this year which may be due to the fact that nearly half of consumers will spend less than $50 this year. Thankfully, only 28% of women reported that they would like to receive more on Valentine's Day, so for the most part couples should be able to enjoy each others company on Feb. 14. PayPal's Can't Buy Me Love survey also showed that George Clooney and Megan Fox topped the list of celebrities you would want Cupid to hit with an arrow. It's not all love though, Kanye West better work on a Valentine's Day auto-tuned hit otherwise he might be spending the day alone as he was voted the celebrity that people would least like to see on Valentine's Day. 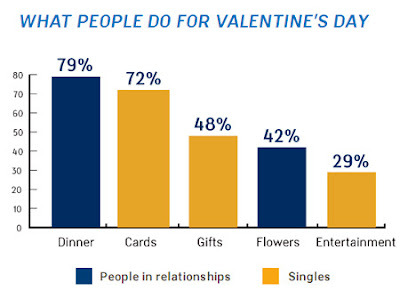 Another interesting bit of information from the survey revealed the differences in valentine spending between single people and those in relationships which is shown on the graph below. If you're planning to spend less this year then you're in luck. Not only are retailers trying to get as much of your $50 as they can, but PayPal and Bing Cashback are upping the discounts to make you look good this year. PayPal is also holding a Twitter Scavenger hunt on Feb. 13 to direct participants to secret locations in Chicago, New York and San Francisco for a chance to win prizes such as netbooks, diamond necklaces and a year of free flowers from ProFlowers. PayPal is also running another online only Twitter contest for those who don't want to run around the city. For more ways to save on great Valentine's Day gifts check out our recent coverage of How to save on Valentine Day gifts.